The 100 µm scale bar applies to figs. 2, 5, 6 and 10; the 10 µm scale bar applies to all other figures. Figs. 1-10. Collosphaera centripetalis. Figs. 1-3: forma brattstroemi. BSS 28B(VIII/747, 30B(F) EF 038, and 28B(VIII/749). Figs. 4-10: forma invaginata. 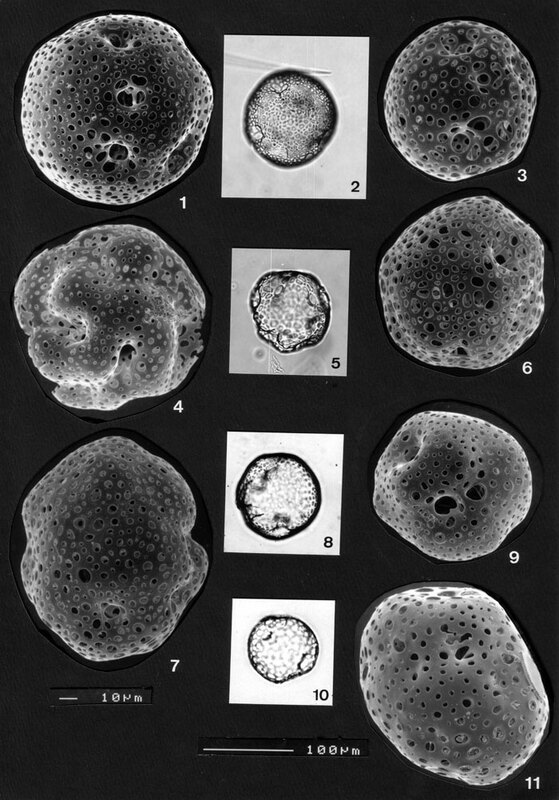 Note differences in number and depth of invaginations, the shape of the shell, and relative size of (smaller) pores. The shape of pores is generally round-ovoid (varying with shell shape); the specimen in fig. 6, however, has angular pores. BSS 30(F) EF 038, IOW 140(F), BSS 28B(VIII/759), IOW 134(F), BSS 28B(VIII/861, 768 and 789). Fig. 11. Collosphaera huxleyi forma tuberosa. BSS 28B(VIII/1047).